Wait, we’re not talking about Elena? Well, I’m much less enthused. The one we’re letting go (beyond being a desperate Frozen link) is, of course, dead Sheriff Liz who takes a prize for being one of the few characters on this show I don’t want to see brutally mauled by armadillos. So we have moving childhood flashbacks from Caroline. Damon struggles over the eulogy and Caroline, in one of her better moments, tells him she doesn’t actually want to have a big bonding session with him on the day of her mother’s funeral (while Vampire Diaries often forgets, Damon and Caroline are not friends). Caroline deals with her grief in classic Caroline style – plans and projects and she recruits everyone so she can have the funeral all done and dusted in record time. She also plans on spending time with Elena, presumably because that suffering will completely eclipse losing her mother. Damon has flashbacks to his own mother’s funeral to add an extra edge to the pathos which also throws in some daddy issues and kid!Stefan. In the present, Adult Stefan has a truly awful sense of timing and decides to ask Damon’s advice (seriously? Damon? Really?) about where his thing with Caroline is going. On the day of Caroline’s mother’s funeral, Stefan is concerned about he and Caroline having a relationship. He has clearly been spending too much time around Elena. Damon’s advice is predictably awful – if he doesn’t feel the same way about Caroline as he did about his past loves (Elena or Elena clones) then it’s not true love (because you can only feel love one way and love for Elena is the truest and purest of loves, it is known). Elena gives advice on how to deal with people’s sympathies (including a woman who decided the best way to express condolences was to get in a dig about Caroline’s dead gay father) since she has a lot of experience with that and Caroline decides she really needs to know about kissing Stefan and what it means. Because the writers of Vampire Diaries can’t even leave out the romance on the day of Liz’s funeral. Damon tries to stay on topic, stressing about giving Liz’s eulogy when he’s not a nice person. He’s comforted by Elena and inspired by more flashbacks. To the open casket pre-funeral and Stefan asks Caroline if she’s ok (which is such a terrible thing to ask to chief mourner at a funeral). She decides to talk relationship (at least acknowledging how horribly inappropriate this is). Stefan begs off because terrible terrible timing and dumping Caroline in front of the open casket of her dead mother would quite possibly be the utterly worst thing that anyone on this show has ever done. 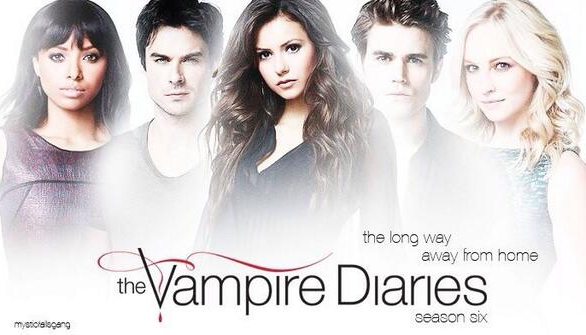 And yes, this is The Vampire Diaries. Speaking of unacceptable, Matt stops Tyler going to the funeral because he’s drink. Yes, he’s so sad about dumping Liv because she did something silly while grieving (and isn’t Elena) that he’s been drunk for several days and couldn’t sober up for Liz’s funeral. The funeral happens complete with police and Damon’s eulogy full of praise for Caroline and what Liz wanted to say to her and Caroline singing. Afterwards they have a wake and Tyler has managed to sober up in tie for Matt to tell him about his plan to become a cop and he wants Tyler to join him. Afterwards Damon and Stefan have a moment and Stefan decides to discount Damon’s advice and realises that all love doesn’t feel the same and just because he doesn’t feel for Caroline what he felt for Elena and her clones doesn’t mean it can’t build into something more. Caroline has gone home for some alone time, but Elena has followed her (alone time is not something Elena understands). Elena is worried that Caroline plans to turn off her humanity. Elena who has been down that road before, says how terrible an idea that is but Caroline hits back that she has always had way more control over her vampireness than Elena has (very true). Caroline also hits back at how Elena is the absolute freaking master of being unable to confront her own grief – turning off her humanity, removing her memories of Damon – so who is she to lecture Caroline about escaping grief? She adds that when Elena came back to herself, the worst of her grief was over – selfish it my have been, but it helped her. Note the plural there. Yes there are several worlds. Jo decides to ask Alaric for advice as the agonise over the decision of a) dying and unleashing lots of imprisoned badness to briefly keep the magic Jo wasn’t using anyway or b) not dying and unleashing hell on earth. Alaric wisely does the “hell no, you make this decision” but words it romantically. Jo makes the obvious decision and gives Kai her magic. Afterwards Kai is fine (alas) and whispers some stunning secret into her ear before leaving, telling her to have a good life. The big secret is that Jo was sick not because of food poisoning or Kai being ill – but because she’s pregnant. Is magical pregnancy senses a thing in the Gemini Coven as well? Alaric proposes and Jo hits back with a no because it’s a blatant pity proposal. He redeems this awful proposal by pulling out a ring and proving that he has actually planned this and it wasn’t a spur of the moment thing prompted by sudden babies. It’s a nice rock as well, so kudos there. She says yes. Over to the spirit world and Bonnie has gone through all kinds of adventures which I would probably have much rather have watched to finally get her magic back from a bloodstained gravestone magic rocky thingy (I’d link to the many episodes that explain it but let’s just take it as a given that a bloodstained uber magic rock is out there – because many seasons of twisty canon went into it). She plans to go home once the eclipse hits (and once she’s finished all the booze). Unfortunately the eclipse that happens every night skips that night, probably because of the whole prison-worlds-are-falling-apart thing because the Gemini Coven have turned “I’m taking you down with me!” into an art form. She’s now in a snowy wilderness complete with northern lights and spooky looking house. She finds a book in the house where someone has written about nightly northern lights (just as her prison had nightly eclipses) and it being the 1st November 1903. She’s fallen into someone else’s prison dimension. I’m confident Bonnie will survive with whoever is there – she’s survived Elena. She also finds pictures of Stefan and Damon. As the worlds oscillate back and forth as Kai gets Jo’s magic, Bonnie decides that eclipse/northern lights are all much of a muchness and she casts the spell to escape anyway; but as she does a woman appears in period dress. Presumably this dimension’s prisoner. Damon goes back to his house to fine – BONNIE! They hug and it is awesome. After hugging she shows him the prisoner she saw – it’s Damon’s mother. Yup, kind of predictable to be honest; all that foreshadowing flashback and parental issues was definitely looming. Stefan finds Elena’s body – I do not care, Bonnie is back! BONNIE IS FINALLY FREE! And probably bringing the new big bad/angst source. Took them long enough! Liz’s big send off – I think it was generally decent. We had a few too many romance moments but Elena managed not to make it all about her which was pretty good. I think Liz got the send off her character deserved. Now, I don’t agree with Caroline turning off her humanity, of course, because every vampires that does that unleashes atrocities. But Elena was an incredible hypocrite here and Caroline’s counters were dead on target. The Gemini Coven seems to really love their load-bearing boss trope. Their whole coven dies if the leader dies but so does everyone in their prison worlds? Or are they released? As a bonus they try to make their coven leader extra traumatised by making them murder their twin just to ensure that the big load bearing leader is a little vulnerable as well. I had a full rant planned about Damon’s terrible advice but then Stefan rightly realised how bad it was. As an aside, my advice to Stefan would be “maybe you and she are or will be in love. But now is not the time – you’re immortal, you can afford to be patient and supportive and wait to explore any mutual feelings you may have until after she has had chance to grieve for her mother and heal, until you are sure any decisions she makes won’t be powered by grief, loneliness and loss” Then I’d slap him for even worrying about it on the day of Liz’s funeral. I also think they need to stop dragging up the Gemini storyline. It’s like a letter with 8 or 9 P.S. at the bottom. It’s done. You don’t get 8 or 9 epilogues. For that matter, Matt & Tyler the cops and Jo & Alaric the parents? Let’s not. Please.